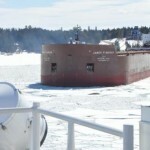 The 305 meter long self-unloader bulk freighter James R Barker became stuck in ice in the St. Marys River near Neebish Island, Michigan. The vessel was heading south from Sault Ste. Marie when it became stuck in ice. 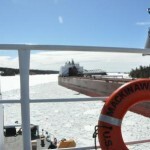 The Coast Guard Cutter Mackinaw arrived on scene and was able to break up ice along the freighter’s starboard side. No reports of injuries, damage or pollution released.